For the average stock, it was a quiet day on Wall Street. The S&P 500 and the Nasdaq Composite both finished in the red. The Dow posted a small gain. In fact, one of the market’s first-half leaders is storming to new all-time highs. If yesterday’s action is any indication, the next leg of the tech melt-up is here. And it’s about to mint traders some incredible gains. We’ve found the evidence pointing to a year-end rally at the very foundation of the tech stock boom: the semiconductors. While almost every investor on the planet is laser-focused on political shenanigans and North Korean missile launches, semiconductors have our full attention. The big tech darlings that everyone left for dead last year came roaring back to retake their rightful throne as market leaders in 2017. 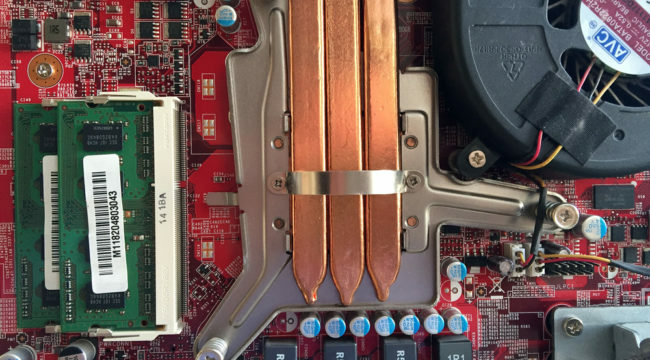 Semiconductor stocks have been one of the best places for your trading dollars – even when the market was stuck in a tight range earlier this year. Of course, the semis didn’t get much of the credit they deserved earlier this year. Aside from a couple of high-profile names like NVIDIA Corp. (NASDAQ:NVDA), these stocks took a backseat to the household name mega-caps. The FAANGs—Facebook, Amazon, Apple, Netflix, Google— had captured Main Street’s imagination. These are the stocks most folks wanted to own this year. But if performance is your top priority, the semis have delivered. Semiconductors slapped around the rest of the market during the first half of the year. Now they’re ready to continue their dominance as the tech sector comes back into focus. The S&P 500 has gained nearly 12% year-to-date. 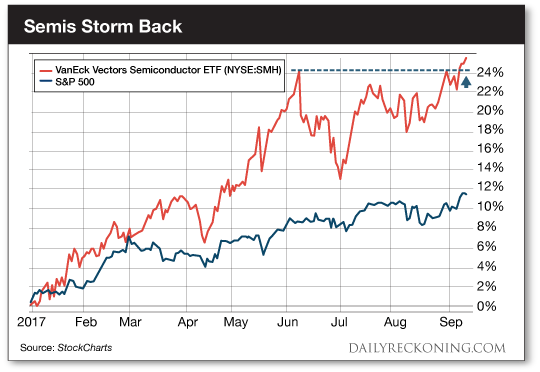 Over that same timeframe, the VanEck Vectors Semiconductor ETF (NYSE:SMH) has gained more than 25%. Semiconductors are once again turning into the ultimate snapback trade for a market melt-up. Remember, traders completely abandoned these stocks over the summer as they gave back a good chunk of their 2017 gains back in June. You probably recall how investors completely freaked out as these popular stocks dropped over the summer. The market mood was ripe for a quick panic. After all, stocks hadn’t endured a meaningful correction in a long time. The record low volatility we experienced over the summer months twisted the herd’s brain in a knot. Investors were treating every single dip as if it was the beginning of a massive market crash. This action set the stage for the rally we’re seeing this week. Now that the semis have regained a leadership role and have once again broken out to new highs, we can expect to see the trend continue higher. Amazon may be on top but this iconic department store is finally escaping retail purgatory. Today, Greg Guenthner reveals how the best retail operations will adapt and survive despite Amazon’s growth and dominance.